The menu is a calling card for hotels, restaurant and food courts. Once customer enters the beautiful decorated dinning place, gets seated by the cordial waiters the next significant things that is presented to him is restaurant menu. Like everywhere, here also the first impression counts, a tastefully designed, attractive and informative menu will have a favorable effect on the consumer. It will act like an appetizer or, simply you can say a food course on its own. The food names, actual photograph of the dishes, attractive graphic, artistic designs will increase the appetite, his taste buds would be eagerly looking forward to having the delicious food made with skill. The best way to get a great menu is to opt for a menu printing company with the latest technology, supreme quality and good industry experience. Finding a company with all these qualities seems to be relatively tough job, but not now, with S S Graphics at your helm; your dream is just a reality. We have the state-of-the-art infrastructure, loaded with latest advanced printers and equipment, and over 18-years experience has a made us the print industry leader. We have printed visually attractive menus for five star hotels, motels, food courts and restaurants. Our in house designers will work on to come up with a unique menu design that customers will enjoy going through the same like they enjoy your great food. 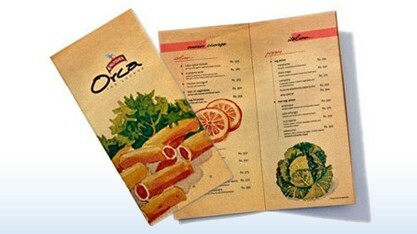 We are pioneers in designing and printing every kind of menu whether it is contemporary or classic. Choose Guwahati Printer as your menu printing partners and see your customer bowled by your menu cards like they are by your hospitality and good food. Menu card Sizes/paper stock as per your business requirement. Menus card Sizes/paper stock as per your business requirement. A great menu design and printed is what gets customers to take a seat at your restaurant's table.With proper use of pictures and graphics the menus should match with the restaurant theme and enhance the ambiance . At S S Graphics with our full colour menu printing, we ensure that your menu adds the perfect feel for your restaurant or hotel enhancing the dining pleasure. Mini sized menus can be of big help in promoting your food business to more people. Pocket menus are portable and are easily handed out to passers-by, mailed out to customers, and even placed on counters . Pocket menus can be parallel folded into 4 panels with pages up to 8, these small sized prints are a lot more than pocket menus used for restaurants and food businesses. You can also use these materials to advertise a menu of your products or services even if you're not in the food business. This can make it easier for customers to order or inquire about what you're offering.